↑ BirdLife International (2012). "Gyps bengalensis". IUCN Red List of Threatened Species. Version 2012.1. International Union for Conservation of Nature. http://www.iucnredlist.org/apps/redlist/details/106003374। আহৰণ কৰা হৈছে: 16 July 2012. ↑ 2.0 2.1 2.2 "White-rumped Vulture (Gyps bengalensis) — BirdLife species factsheet". BirdLife.org. BirdLife International. http://www.birdlife.org/datazone/speciesfactsheet.php?id=3374। আহৰণ কৰা হৈছে: 2011-06-01. ↑ 3.0 3.1 "New nestlings bring cautious hope for Asia's Threatened vultures". BirdLife.org. BirdLife International. 2009-06-08. http://www.birdlife.org/news/news/2009/08/vulture_success.html। আহৰণ কৰা হৈছে: 2011-06-01. ↑ Prakash, V; Pain, D.J. ; Cunningham, A.A.; Donald, P.F. ; Prakash, N.; Verma, A.; Gargi, R.; Sivakumar, S. et al. (2003). "Catastrophic collapse of Indian white-backed Gyps bengalensis and long-billed Gyps indicus vulture populations". Biological Conservation খণ্ড 109 (3): 381–390. doi:10.1016/S0006-3207(02)00164-7. ↑ 5.0 5.1 5.2 Rasmussen, Pamela C.; Anderton, J. C. (2005). 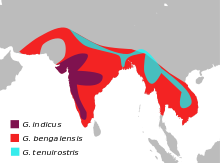 Birds of South Asia: The Ripley Guide. Volume 2. Smithsonian Institution and Lynx Edicions. পৃষ্ঠা. 89–90. ↑ 6.0 6.1 Hume, Allan Octavian (1896). My Scrap Book or rough notes on Indian Ornithology. প্ৰকাশক Calcutta: Baptist Mission Press. পৃষ্ঠা. 26–31. http://www.archive.org/details/myscrapbookorrou00hume। আহৰণ কৰা হৈছে: 2011-06-01. ↑ 8.0 8.1 Whistler, Hugh (1949). Popular Handbook of Indian Birds. প্ৰকাশক London: Gurney & Jackson. পৃষ্ঠা. 354–356. ISBN 1-4067-4576-6. http://www.archive.org/details/popularhandbooko033226mbp. ↑ Satheesan SM (1994). "The more serious vulture hits to military aircraft in India between 1980 and 1994." (pdf). Bird Strikes Committee Europe, Conference proceedings. BSCE, Vienna. http://www.int-birdstrike.org/Vienna_Papers/IBSC22%20WP23.pdf. ↑ Singh, R B (1999). "Ecological strategy to prevent vulture menace to aircraft in India.". Defence Science Journal খণ্ড 49 (2): 117–121. http://publications.drdo.gov.in/gsdl/collect/defences/index/assoc/HASH0129/367f4611.dir/doc.pdf. ↑ Satheesan, SM & Manjula Satheesan (2000). "Serious vulture-hits to aircraft over the world". International Bird Strike Committee IBSC25/WP-SA3. IBSC, Amsterdam. http://www.int-birdstrike.org/Amsterdam_Papers/IBSC25%20WPSA3.pdf. ↑ 13.0 13.1 Cunningham, David Douglas (1903). Some Indian friends and acquaintances. প্ৰকাশক London: J Murray. পৃষ্ঠা. 238. http://www.archive.org/details/someindianfriend00cunnrich। আহৰণ কৰা হৈছে: 2011-06-01. ↑ Morris, R. C. (1934). "Death of an Elephant Elephas maximus Linn. while calving". J. Bombay Nat. Hist. Soc. খণ্ড 37 (3): 722. ↑ 15.0 15.1 Ali, Sálim; Ripley, Sidney Dillon (1978). Handbook of the birds of India and Pakistan, Volume 1 (2 সম্পাদনা). Oxford University Press. পৃষ্ঠা. 307–310. ISBN 978-0-19-562063-4. ↑ Gough, W. (1936). "Vultures feeding at night". J. Bombay Nat. Hist. Soc. খণ্ড 38 (3): 624. ↑ Morris, R. C. (1935). "Vultures feeding at night". J. Bombay Nat. Hist. Soc. খণ্ড 38 (1): 190. ↑ Grubh, R. B. (1973). "Calcium intake in vultures of the genus Gyps". J. Bombay Nat. Hist. Soc. খণ্ড 70 (1): 199–200. ↑ 19.0 19.1 Sharma, Indra Kumar (1970). "Breeding of the Indian whitebacked vulture at Jodhpur". Ostrich খণ্ড 41 (2): 205-207. doi:10.1080/00306525.1970.9634367. ↑ V. Prakash, R.E. Green, D.J. Pain, S.P. Ranade, S. Saravanan, N. Prakash, R. Venkitachalam, R. Cuthbert, A.R. Rahmani, & A.A. Cunningham (2007). "Recent changes in populations of resident Gyps vultures in India" (pdf). J. Bombay Nat. Hist. Soc. খণ্ড 104 (2): 129–135. https://www.rspb.org.uk/Images/IndianVultureDeclines_tcm9-188415.pdf. ↑ Baral, Nabin; Gautam, Ramji; Tamang, Bijay (2005). "Population status and breeding ecology of White-rumped Vulture Gyps bengalensis in Rampur Valley, Nepal" (pdf). Forktail খণ্ড 21: 87–91. http://www.orientalbirdclub.org/publications/forktail/21pdf/Baral-Vulture.pdf. ↑ Green, Rhys E.; Newton, IAN; Shultz, Susanne; Cunningham, Andrew A.; Gilbert, Martin; Pain, Deborah J.; Prakash, Vibhu (2004). "Diclofenac poisoning as a cause of vulture population declines across the Indian subcontinent". Journal of Applied Ecology খণ্ড 41 (5): 793–800. doi:10.1111/j.0021-8901.2004.00954.x. ↑ Meteyer, Carol Uphoff, Rideout, Bruce A., Gilbert, Martin, Shivaprasad, H. L., Oaks, J. Lindsay (2005). "Pathology and proposed pathophysiology of diclofenac poisoning in free-living and experimentally exposed oriental white-backed vultures (Gyps bengalensis)". J. Wild. Dis. খণ্ড 41: 707–716. ↑ Swan, Gerry; Naidoo, Vinasan; Cuthbert, Richard; Green, Rhys E.; Pain, Deborah J.; Swarup, Devendra; Prakash, Vibhu; Taggart, Mark et al. (2006). "Removing the Threat of Diclofenac to Critically Endangered Asian Vultures". PLoS Biology খণ্ড 4 (3): e66. doi:10.1371/journal.pbio.0040066. PMID 16435886. ↑ Gilbert, Martin; Watson, Richard T.; Ahmed, Shakeel; Asim, Muhammad; Johnson, Jeff A. (2007). "Vulture restaurants and their role in reducing diclofenac exposure in Asian vultures". Bird Conservation International খণ্ড 17: 63. doi:10.1017/S0959270906000621. ↑ "First Captive-Bred Asian Vulture Chicks Die". planetark.com. Reuters. 2007-02-23. http://www.planetark.com/dailynewsstory.cfm/newsid/40468/story.htm। আহৰণ কৰা হৈছে: 2011-06-01.